La Jolla Light, “LET’S REVIEW: Recycled art exhibits shine at California Center for the Arts,” by Lonnie Burstein Hewitt, May 1, 2017. The R word — Recycling — has been a buzzword in the art world for more than a few years. 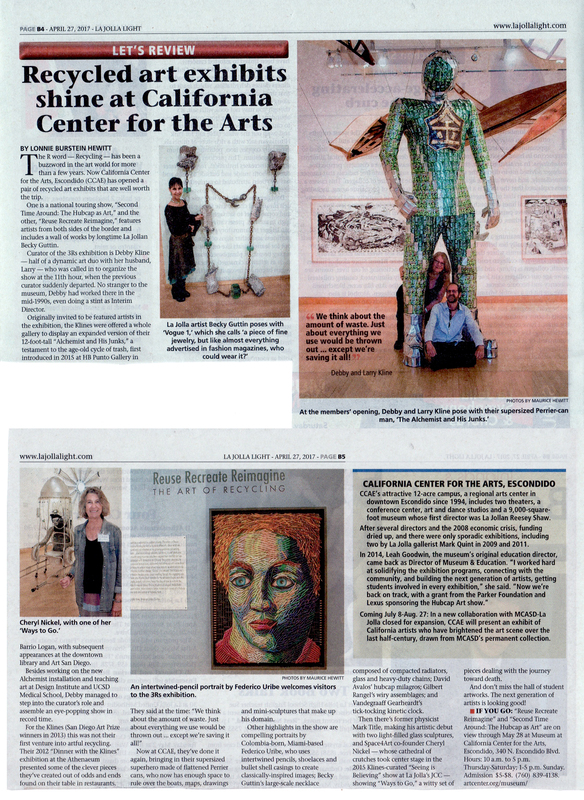 Now California Center for the Arts has opened a pair of recycled art exhibits that are well worth the trip to Escondido. One is a national touring show, “Second Time Around: The Hubcap as Art,” and the other, “Reuse Recreate Reimagine,” features artists from both sides of the border and includes a wall of works by longtime La Jollan Becky Guttin. Curator of the 3Rs exhibition is Debby Kline — half of a dynamic art duo with her husband, Larry — who was called in to organize the show at the 11th hour, when the previous curator suddenly departed. No stranger to the museum, Debby had worked there in the mid-1990s, even doing a stint as Interim Director. Originally invited to be featured artists in the exhibition, the Klines were offered a whole gallery to display an expanded version of their 12-foot-tall “Alchemist and His Junks,” a testament to the age-old cycle of trash, first introduced in 2015 at HB Punto Gallery in Barrio Logan, with subsequent appearances at the downtown library and Art San Diego. Besides working on the new Alchemist installation and teaching art at Design Institute and UCSD Medical School, Debby managed to step into the curator’s role and assemble an eye-popping show in record time. Now at CCAE, they’ve done it again, bringing in their supersized superhero made of flattened Perrier cans, who now has enough space to rule over the boats, maps, drawings and mini-sculptures that make up his domain. Other highlights in the show are compelling portraits by Colombia-born, Miami-based Federico Uribe, who uses intertwined pencils, shoelaces and bullet shell casings to create classically-inspired images; Becky Guttin’s large-scale necklace composed of compacted radiators, glass and heavy-duty chains; David Avalos’ hubcap milagros; Gilbert Rangel’s wiry assemblages; and Vandegraaff Gearheardt’s tick-tocking kinetic clock. Then there’s former physicist Mark Title, making his artistic debut with two light-filled glass sculptures, and Space4Art co-founder Cheryl Nickel — whose cathedral of crutches took center stage in the 2015 Klines-curated “Seeing is Believing” show at La Jolla’s JCC — showing “Ways to Go,” a witty set of pieces dealing with the journey toward death. And don’t miss the hall of student artworks. The next generation of artists is looking good! CCAE’s attractive 12-acre campus, a regional arts center in downtown Escondido since 1994, includes two theaters, a conference center, art and dance studios and a 9,000-square foot museum whose first director was La Jollan Reesey Shaw. After several directors and the 2008 economic crisis, funding dried up, and there were only sporadic exhibitions, including two by La Jolla gallerist Mark Quint in 2009 and 2011. Coming July 8-Aug. 27: A new collaboration. With MCASD-La Jolla closed for expansion, CCAE will present an exhibit of California artists who have brightened the art scene over the last half-century, drawn from MCASD’s permanent collection. May 3, 2017 | Filed under Curatorial, Reviews and tagged with California Center for the Arts Museum, La Jolla Light, Lonnie Burstein Hewitt, perrier art, Recycled Art, The Alchemist.